Dave Gregory in tackling action in Ponteland's match against North Shields on Saturday. Picture by Keith Robertson. Ponteland took another step towards promotion with a convincing victory on Saturday. The hosts made a few changes from their last game, which included playing Phil McAreavey at eight and bringing in James Shiells at full-back for his first game following knee surgery. On a cold, sunny day, Pont were quickly out the blocks as Jonny Murphy and Richie Moller made early yards. The first scrum saw North Shields shunted backwards in what was to become the pattern of the day. A quick turnover by Dan Marcus saw Ponteland awarded a five-metre scrum. As the forwards drove on, Marcus picked up the ball and went over to make it 5-0 after five minutes. Murphy added the extras. From the kick-off, David Gregory made a bullocking run to set Moller free and only good defensive tackling kept him out. However, a 20-metre line-out drive then saw Chris Searle touch down for an unconverted try. The home team continued to destroy the visitors in the set-piece and following another line-out drive, the excellent Nick Townshend ghosted his way over the line. Murphy kicked over the conversion (19-0). Pont’s forwards again made ground and following a ten-metre scrum drive, McAreavey went over for the bonus point try on 27 minutes, with Murphy on song again. A sweeping move by Marcus and Moller saw Murphy clear, only to be brought back for a suspected forward pass. A driving line-out from the halfway line then saw Chris Searle break blind as Ponteland went for another score. However, he was tackled on the line as the visitors continued to tackle their socks off and it remained 26-0 at half-time. The hosts changed a number of personnel to look at different combinations with a view to trying out new training-ground moves. From the kick-off, several quick passes put Chris Searle clear, but another forward pass was given. However, the scrum was won against the head by Cam Bell and Marcus broke clear from 40 metres to score. The conversion by Murphy was successful. Pont continued to play excellent rugby, but North Shields’ defence was resolute as they continued to put their bodies on the line. The away side then had a spell of possession and on 65 minutes, a kick-through saw them attacking the Ponteland line. 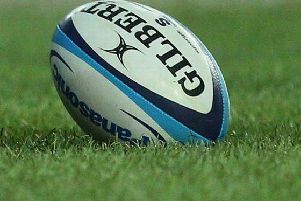 They threatened to score a try after a charge-down, only thwarted by quick-thinking defence thwarted. But five minutes later, a training-ground move on the half-way line saw North Shields intercept to run in a converted try (33-7). This was just reward for the commitment shown by the visitors. As in previous games, the score galvanised Pont into action and a new line-out move saw the ball off the top setting the backs away. The final pass went to Mark Kelly, who ran a superb line to crash over, however the referee said he didn’t ground the ball. Ponteland continued to press and it looked as though they would score from a five-metre scrum as they drove North Shields backwards. Unfortunately, they drove too quickly and lost control of the ball. However, as the visitors tried to clear their lines. An excellent turnover by Simon Grant saw the forwards pick and go, with Craig Robinson claiming the unconverted try. With the clock running down, a piercing break by Phil Bramble set Gregory on his way and his offload saw Michael Searle canter in for a try. As the conversion was missed, the final score was 43-7. North Shields defended with gusto and made several inroads in the game, but in truth they had little answer for the all consuming pace and power of the home team.